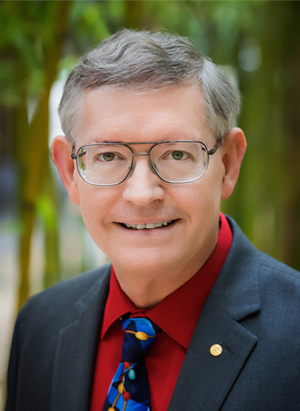 W. E. Moerner conducts research in physical chemistry and chemical physics of single molecules, single-molecule biophysics, super-resolution imaging and tracking in cells, and trapping of single molecules in solution. His interests span methods of precise quantitation of singlemolecule properties, to strategies for three-dimensional imaging and tracking of single molecules, to applications of single-molecule measurements to understand biological processes in cells, to observations of the photodynamics of single photosynthetic proteins and enzymes. Moerner has been elected Fellow/Member of the NAS, American Academy of Arts and Sciences, AAAS, ACS, APS, and OSA. Major awards include the Earle K. Plyler Prize for Molecular Spectroscopy, the Irving Langmuir Prize in Chemical Physics, the Pittsburgh Spectroscopy Award, the Peter Debye Award in Physical Chemistry and the Wolf Prize in Chemistry and the 2014 Nobel Prize in Chemistry. He has also earned the Distinguished Eagle Scout Award. Moerner earned his PhD in Physics from Cornell University.